Each Talon is hand-crafted one at a time. "... 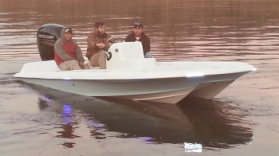 It is quite possibly the driest, softest riding 16 to 20 ft. light tackle boat ever built. And, it's fast, of course! It features a 8 ft. 6 in. beam with super wide gunwales, and more usable deck space than most any 20 footer on the market today."